i haven't been feeling very well, i tried to get an appointment with my doctor today, but couldn't get in until Wednesday. *sigh* a little concerned about how i'm going to get through my jump lesson tomorrow... nothing to it but to do it, right? ;) at least the weather has cooled off, it was lovely today! 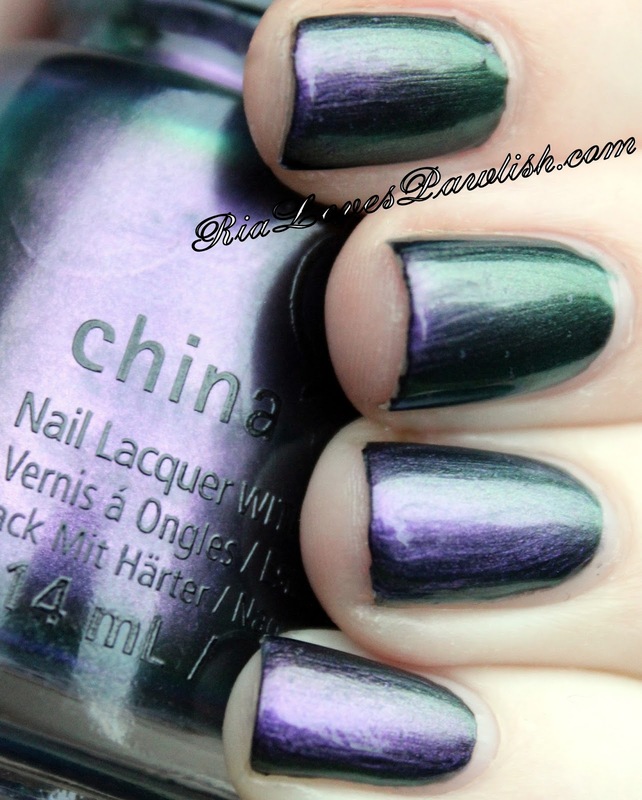 today we have the last China Glaze The Great Outdoors polish to look at... Pondering! (it's a press sample, kindly provided for review). it's a also the third and final duochrome... with a strong purple to green shift. it's opaque in about two coats on its own, but i like it over a black creme to conserve polish... i also feel like it makes the color shift stronger! because of all the dimension this polish has, brushstrokes aren't very noticeable... but still try and keep your strokes even just in case :D i have decided that i do, in fact, prefer the duochromes with topcoat, but they are certainly wearable and have a nice shine on their own. one coat Pondering, over one coat Salon Perfect Oil Slick, finished off with one coat Salon Perfect Crystal Clear Top Coat (all are press samples).